In the article I talk about the "Behind the scenes" of the deck art. 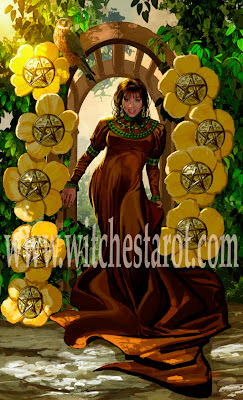 I include a snippet from the script I wrote and the sketch and finished card that I posed for (The Nine of Pentacles). 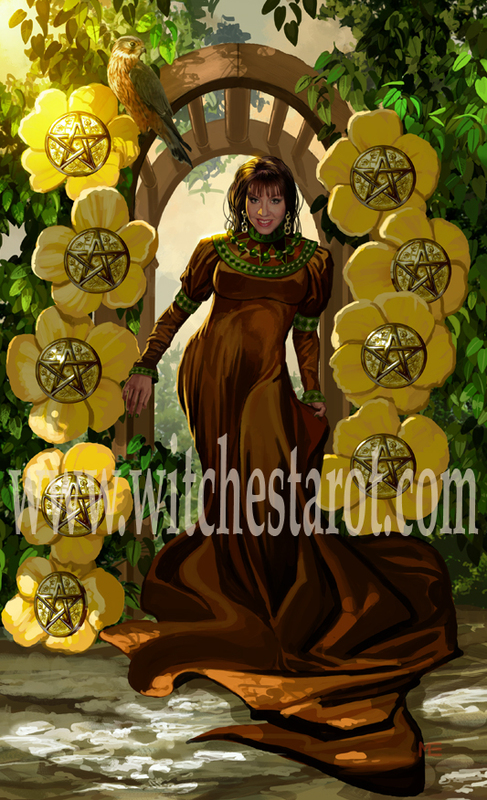 Here is the finished Nine of Pentacles card. In other news my oldest son Kraig just bought his first house! He closed yesterday and got his keys- it's official! Today he and I are going paint shopping- as I promised to spring for paint for his kitchen. The house is charming, with a new kitchen and bath. However, at the moment, the kitchen is a ghastly shade of a chalky pale yellow. Not quite the "manly look" a guy is going for. So he has chosen a new earthier shade that compliments the stylish oak cabinets and gorgeous tile...and today we bust out the paint and start painting! For the next week the family is going to help him clean, paint and then the big move will happen in about a week or so. Traditionally Knight cards in the tarot symbolize "Movement." How's that for synchronicity? 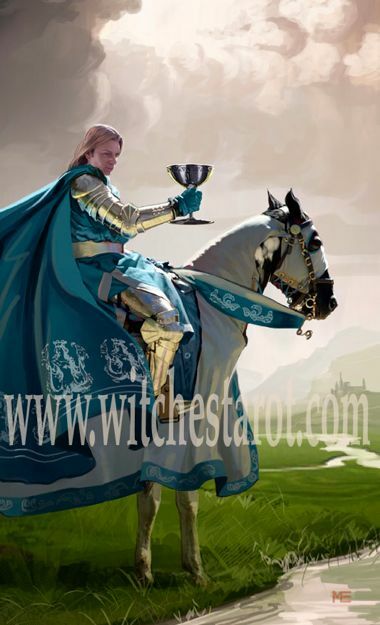 My son Kraig actually posed for the Knight of Cups card and it looks just like him. I talked my husband and adult kids into each posing for a card too. Want to know who's who? Read the article by clicking on the link above. 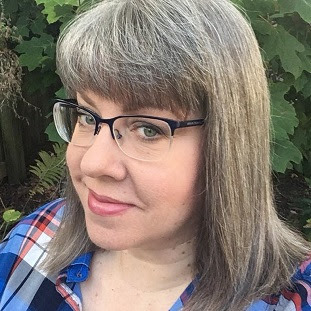 When you read my Llewellyn Journal article you will find out the real story behind the cards and why I chose specific relatives and friends to pose for various Court and Minor Arcana cards. I bet you will enjoy the anecdote behind the Page of Cups and Page of Sword reference photo shoot. All I ask is that we keep the story about my nephew swinging fireplace tongs next to my mother's china cabinet all to ourselves. Hatch River Expeditions offers a wide variety of Grand Canyon white water rafting, hiking and kayaking trips and packages to meet your needs: half Canyon to full Canyon, motorized or oar – powered, we have what you are looking for. Whichever you choose, we can help make your trip to one of the Seven Natural Wonders of the World an unforgettable one. We take care of all the details so your Grand Canyon vacation can be just that…a vacation!